When it comes to addressing the profound challenges presented by the Earth’s warming atmosphere, three words — “adaptation,” “mitigation” and “resilience” — are frequently deployed. But what do these buzzwords actually mean when it comes to addressing global warming in Rhode Island? First, let’s define each of the words. Adaptation: “Adjustment or preparation of natural or human systems to a new or changing environment which moderates harm or exploits beneficial opportunities,” Environmental Protection Agency. Mitigation: “Processes that can reduce the amount and speed of future climate change by reducing emissions of heat-trapping gases or removing them from the atmosphere,” U.S. Climate Resilience Toolkit. Resilience: “A framework and principles to ensure that investments in climate change adaptation are scientifically sound, socially just, fiscally sensible, and adequately ambitious,” Union of Concerned Scientists. These words are used so often and interchangeably — agencies even use the terms differently — that their meanings have been diminished, as if simply uttering them addresses the many challenges presented by climate change. In this era when we are witnessing the climate change in mere decades instead of thousands of years, thanks to building concentrations of atmospheric greenhouse gases, a bounce back likely isn't in the cards. The system is closing in on collapse. This chart and the one below are from Chapter 4 of the Beach SAMP. Downtown Providence and Wickford village in North Kingstown are at risk of significant damage from 3 feet of sea-level rise. Coastal roads in Narragansett and Jamestown are at risk of being underwater with a foot of sea-level rise. On Aquidneck Island, sea level-rise maps of Newport’s waterfront, the heart of a thriving tourist economy, reveal large swaths of harbor-side neighborhoods inundated and prominent waterside landmarks partially submerged, all within an enlarged harbor created by an additional 5 feet of sea. The Island Park neighborhood in Portsmouth is among the most vulnerable areas in the state to storm surge and sea-level rise. Statewide, about $4.5 billion worth of property lies on land less than 5 feet above the high-tide line, and in Newport, for example, there is a 33 percent chance of a flood that high by 2040. Rising seas also generate saltwater intrusion that can contaminate drinking-water supplies and private wells, damage septic systems, reduce the lifespan of asphalt, and threaten freshwater wetlands. CRMC, a Wakefield-based state agency with regulatory functions and a staff that includes engineers, biologists, and a coastal geologist, is one of the leading agencies in the country when it comes to addressing global warming. The agency has developed a number of climate-change tools that model, project and educate, such as STORMTOOLS and Sea Level Affecting Marshes Model (SLAMM). The U.S. Virgin Islands, New Hampshire and California have all reached out to Fugate and CRMC to ask for assistance in creating climate-change maps and tools. ecoRI News recently met with Fugate and Boyd to discuss Rhode Island’s climate-change challenges and how the aforementioned climate strategies are and should be used to address local problems. The Ocean State has about 420 miles of coastline that extends inland to include multiple waterways, most notably Narragansett Bay. Shoreline types along the bay include vegetative buffers and salt marshes, riprap, bulkhead and other hardened structures. The bay’s shoreline also features disturbed areas, preserved marshland, post-industrial fill and polluting businesses. The bay’s working waterfront includes sites that store hazardous materials. 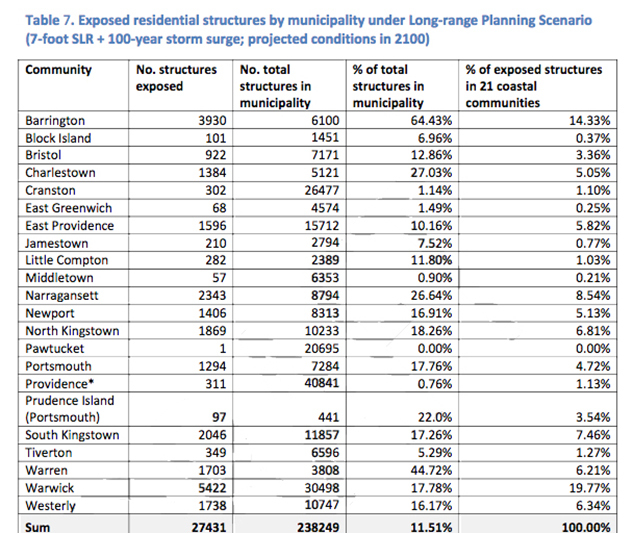 Sea-level rise, storm surge and upland flooding in the Narragansett Bay watershed pose a considerable risk to coastal municipalities along the bay, most notably Providence, Warwick, Warren and Barrington. He said sea-level rise of 5-7 feet would cover Providence’s downtown financial district and the Port of Providence in water. This projected soggy future for downtown and ProvPort doesn’t even take storm surge into consideration. 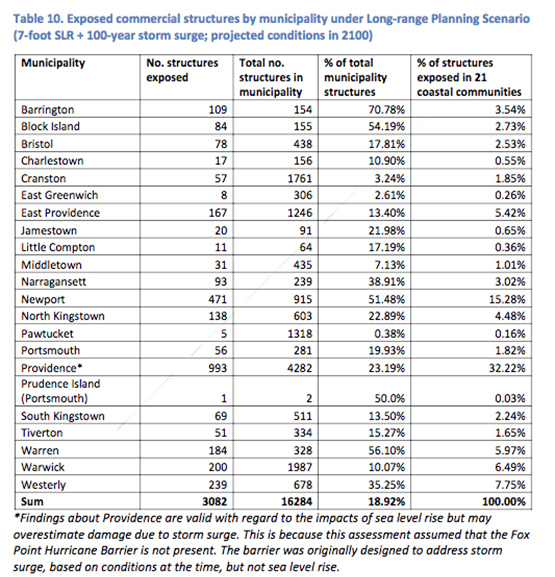 Closed or open, sea-level rise or storm surge, the Fox Point Hurricane Protection Barrier does nothing to protect the neighborhoods of South Providence and Washington Park from the toxins, chemicals and pollutants buried in the dirt and hidden in the asphalt and concrete of the city’s working waterfront. The Port of Providence serves as a coal port, a fuel-oil depot, and a train depot for ethanol. It’s also home to several chemical-processing plants, including a facility that manufactures chemicals for hydraulic fracturing. The area proposed for a second waterfront LNG facility is heavily contaminated. The 42-acre site on the Providence River has endured more than a century of pollution. It once hosted an Army rifle range, a coal gasification plant, and propane and kerosene storage facilities. Should this area be flooded by sea-level rise or storm surge associated with a hurricane like the one Rhode Island witnessed in 1954 — a 100-year event, according to Fugate, meaning it has a 1 percent chance of happening annually — or 1938, a 250-year event, those two neighborhoods would be soaked with some serious nastiness. Not all of the Ocean State’s 21 coastal communities, however, are along the shores of Narragansett Bay. Many, such as Charlestown, Narragansett and Westerly, are on the open ocean and that presents a different set of climate-change problems, like accelerating erosion. For instance, along the state’s more exposed southern shoreline in communities from Point Judith to Watch Hill, Matunuck, Misquamicut and South Kingstown Town Beach have lost some 400 feet of beach combined during the past four decades. Charlestown Town Beach has lost about 150 feet to erosion since 1939. Two of Rhode Island’s more popular tourist destinations, Easton’s Beach in Newport and Sachuest Beach in Middletown, are losing about a foot of shoreline annually. Saltwater marshes, nature’s protector against storm surge, are already drowning. If someone were to buy a waterfront home in Rhode Island today with a typical 30-year mortgage, there is a 26 percent chance a 100-year storm would hit during the life of that mortgage. The damage caused in fall 2012 by Sandy highlighted the vulnerability of the state’s coastal areas to the effects of worsening storms and a changing climate. When Sandy hit Rhode Island in late October, it was barely a tropical storm, but it hung around for so long that it caused big problems. Sandy’s storm surge was 5 feet lower than that of the 1938 hurricane, but it still caused a lot of damage — an estimated $42 million in Rhode Island recovery costs. The so-called superstorm stripped some 1,600 tons of sand from Narragansett Town Beach and dumped about 18,000 tons onto Atlantic Avenue in Westerly. In Charlestown, more than 4 feet of sand wound up on Charlestown Beach Road. Storm waves tossed boulders around like beach balls along the Charlestown Breachway. In all, the Ocean State lost about 90,000 cubic yards of beach sand because of Sandy’s rude visit. As the burning of fossil fuels continue to warm the oceans, Rhode Island will experience a growing number of more intense storms that drop more and more precipitation, according to Boyd. The March 2010 floods were an early example. He noted that Houston has experienced 500-year weather events three times in the past five years, including Hurricane Harvey last year. Ellicott City in Howard County, Md., has experienced 1,000-year events twice in the past three years. Adaptation examples: Relocating buildings out of floodplains or further inland from rising seas; planting vegetation with high salt tolerance that are capable of rapid establishment can help prevent coastal erosion; growing a variety of native plants to promote healthy habitats; using less water during times of drought. R.I. efforts: Rhode Island Shoreline Change Special Area Management Plan (Beach SAMP) was created to bring state, federal, municipal, academic and private-sector interests together to create a plan to help communities adapt to short-term and long-term shoreline change; since the flooding of March 2010, Cranston has been buying houses and tearing them down, as some 20 homes in flood-prone neighborhoods along the Pawtuxet and Pocasset rivers have been razed and the lots reclaimed by nature; University of Rhode Island researchers are studying key areas to understand how the coast has changed, what it may look like in the future, and what infrastructure is at risk; the state’s coastal construction setback program requires commercial properties to be set back 60 times the erosion rate; allowing some beaches to do what they want to do naturally, as Black Point in Narragansett, East Beach in Charlestown and Quonochontaug Beach in Westerly are doing fine on their own; some buildings along the Westerly coast have been moved 30 or so feet back, others are being built higher off the ground and nearly 200 beach parking spaces have been removed to create a bigger coastal buffer; CRMC is developing Rhode Island flood-zone maps that are more accurate than the ones currently offered by the Federal Emergency Management Agency. Climate-change mitigation basically comes down to reducing greenhouse-gas emissions, which are trapping heat and warming the atmosphere. But even if humans stopped emitting all greenhouse gases today, as Boyd noted when it comes to sea-level rise, the Earth’s atmosphere would still need time to “digest” all the extra carbon dioxide and methane. Climate change is directly linked to human activity, overpopulation and consumption. The many challenges to mitigating the impacts of a changing climate are closely tied to environmental protections, public health, public transportation, land use, and social justice. Brown University professor Timmons Roberts has noted that Rhode Island's goal of cutting carbon dioxide emissions 80 percent by 2050 isn’t sufficient to slow the effects of climate change. The latest research, he says, suggests human-caused greenhouse-gas emissions must be cut to zero by 2035. The Rhode Island Executive Climate Change Coordination Council (EC4) is the best entity to lead emission-reduction action, according to Roberts, who serves on an EC4 subcommittee. But he says the council of state agency bosses is moving too slowly. He has criticized the EC4’s 2016 analysis of the state emission plan for failing to advocate for a proposal to achieve the carbon reductions. “It wasn’t actually a plan. It doesn’t really tell us how we are going to get there. It lacks the social and the political and economic steps we can make and the policy tools at the economy-wide level,” Roberts said during a May 2017 panel discussion in Providence. Political support for the proposed Clear River Energy Center in Burrillville won’t help mitigate local climate-change impacts. If built, the facility would become Rhode Island’s largest fossil-fuel power plant and the largest emitter of greenhouse-gas emissions in the state. To mitigate the impacts of global warming, Rhode Island’s focus, incentives and political support need to be fixated on carbon-neutral energy sources such as solar, wind and tidal power. The current atmospheric concentration of CO2 is 411 parts per million. In fact, last year was the first in many to see a jump in carbon emissions worldwide. Mitigation examples: Plant trees which absorb carbon dioxide; replace incandescent lights with compact fluorescent bulbs that use less electricity; improve energy efficiency; modernize power grids; better use of public transportation; increased landfill methane recovery. R.I. efforts: Rhode Island Ocean Special Area Management Plan (Ocean SAMP) was created to help Rhode Island and the Northeast make wise choices for long-term enhancement of shared ocean resources, including offshore renewable-energy siting; Block Island Wind Farm; Central Landfill in Johnston hosts one of the largest landfill-gas power plants east of the Mississippi River and is the state’s largest producer of renewable energy; Rhode Island is a member of the nine-state Regional Greenhouse Gas Initiative; continued efforts to get a carbon-tax bill approved. Rhode Island’s definition doesn’t exactly align with the one adopted by the Union of Concerned Scientists. In fact, growth — of the human population, of natural resource consumption — is what feeds climate change. Adequately addressing global warming's tangle of environmental, societal and economic impacts is no easy task. Sacrifice is part of the solution. Growth is not. There are no solutions that require zero sacrifice and embrace growth. The hope with Resilient Rhody is that it doesn’t end up being a political tool strategically unveiled before an election. Most of Rhode Island’s environment-related state reports, guides and plans are celebrated, filed away and then ignored as the local inequality chasm widens and the Ocean State’s natural world is chewed up. One climate-related issue Rhode Island is already well focused on is the vulnerability of wastewater treatment plants, as increasingly intense storms have damaged such facilities and pump stations, which are typically located in low-lying areas. Of the state’s 19 major treatment facilities, seven are predicted to become predominantly inundated in a catastrophic event, according to a Rhode Island Department of Environmental Management study. The Rhode Island Department of Health (DOH) is studying vector-borne diseases associated with a warming and wetter local climate and educating the public about the growing problem. Between 2016 and 2017, Rhode Island saw a 22 percent increase in the number of cases of Lyme disease reported by health-care providers to the DOH. Earlier this month, the Centers for Disease Control and Prevention issued a report stating that the number of cases of diseases that are transmitted by ticks, mosquitos and other insects more than tripled between 2004 and 2016. “We’re not doing enough yet to address the impacts of climate change, but we have the information to make the necessary moves,” Fugate said. “It takes leadership." Resilience examples: Multi-stable socio-ecological systems; smart growth; low-impact development; planning that accounts for both acute events such as heavy rains, hurricanes and wildfires that will become more frequent and intense as the climate changes and for chronic events such as rising sea levels, worsening air quality and population migration; regional wastewater treatment facilities. R.I. efforts: PREP-RI online module series helps municipal decision-makers make effective choices supporting resilience to the impacts of climate change; Rapid Property Assessment and Coastal Exposure (Rapid PACE) helps local officials and property owners view areas exposed to coastal hazards; lauded renewable-energy programs.